* He has no jacket at the table. * He's reading a newspaper. * He must be a bad father. No where was a man's breeding or lack thereof more on display than at the table. While some rules seem a bit quaint, most 19th Century table manners would not be out of place today. People still don't like it when you slurp your soup, or spray food when you talk. "Nothing indicates a well bred man more than a proper mode of eating. A man may pass muster by dressing well, and may sustain himself tolerably in conversation; but if he be not perfectly "au fait", dinner will betray him." Manners aside, all was not well at the American table. 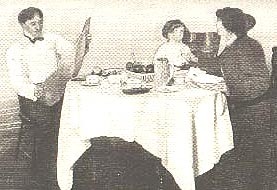 Numerous commentators noted the absence of the husband from the domestic table, American's refusal to carry on friendly conversation while eating, and a tendency to eat rapidly and get the job of eating over as soon as possible. It was little wonder that dyspepsia (indigestion) was considered an epidemic among American men. * Do not play with the table utensils or crumble the bread. * Never, if possible, cough or sneeze at the table. * Never tilt back your chair while at the table, or at any other time. * Do not open the mouth while chewing, but keep the lips closed. It is not necessary to show people how you masticate your food. * Never indicate that you notice anything unpleasant in the food. * Do not break your bread into the soup, nor mix with gravy. It is bad taste to mix food on the plate. * Never leave the table before the rest of the family or guests, without asking the host or hostess to excuse you. * Eat soup with the side of the spoon, without noise. * The fork is used to convey the food to the mouth, except when a spoon is necessary for liquids. * Raw oysters are eaten with a fork. * If you wish to be served with more tea or coffee, place your spoon in your saucer. * Tea or coffee should never be poured into the saucer to cool, but sipped from the cup. * If a dish is presented to you, serve yourself first and then pass it on. * Never wear gloves at the table, unless your hands are for some special reason unfit to be seen. * Never, when serving others, overload the plate nor force upon them delicacies which they decline. * Never make a great display when removing hair, insects or other disagreeable things from your food. Place them quietly under the edge of your plate. * Break your bread, do not cut it. * If a course is set before you that you do not wish, do not touch it. * It is not your business to reprove the waiter for improper conduct; that belongs to your host. * Use a napkin only for your mouth. Never use it for your nose, face or forehead. * It is very rude to pick your teeth at the table. If it becomes necessary to do so, hold your napkin over your mouth. "At a sign from the hostess, the ladies all rise from the table, and repairing to the drawing-room, leave the gentlemen to their own devices. But it is a healthy sign that the gentlemen soon follow them. In France the gentlemen and ladies all leave the dinner table together, as indeed they do here, at an informal or family dinner." "In America, with the exception of dancing, which is almost wholly confined to the unmarried of both sexes, all the enjoyments of the men are found in the absence of women. They dine, they play cards, they have musical meetings, they have suppers, all in large parties, but without women"
"The company remained a very little while at table, and spoke scarcely a word. They really did not give themselves time to eat their food properly, but bolted it burning hot and not half-chewed, although nobody had anything to do when the meal was over. They seem to have got into the habit of regarding every thing as business, and therefore to be performed with the utmost possible dispatch"
Submitted by Unregistered on Mon, 03/21/2011 - 9:21am.